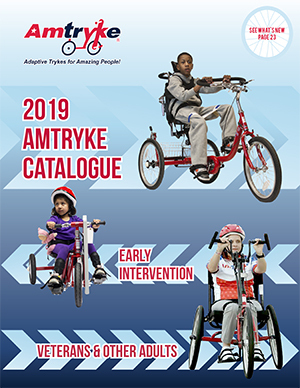 The 2019 Amtryke Catalogue: Digital preview is now available online. See page 23 for a quick snapshot of what’s new! We will print in time for the new year. An announcement will be made here and on facebook when the print version is available. If you need a hard copy, the 2018 Amtryke catalogues are still available for just the actual cost of shipping. To order, contact Roxanne 800-838-1845 x116 or roxannen@ambucs.org. 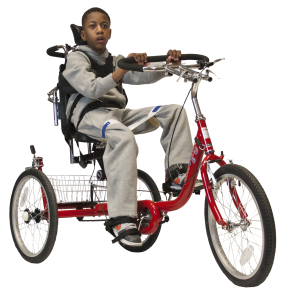 See our full line up of Adaptive Tricycles for people from age 2 to 102! With our fleet of 15 trykes and hundreds of accessories – nearly everyone can be a successful rider. Our trykes can be powered by the feet, the hands or both feet and hands together – depending on the rider’s ability and therapeutic goals.